Yeh it was a comfortable fight for Joshua. The Ref spoilt the fight he just stop them too much, he shouldn't ref a top fight again. Parker was out classed it seemed that as the fight went on he knew he was miles behind and settled for being the 1st man not to be KO'd by Joshua. A different ref and could have been a very different fight. I think the scorecards should be communicated with fighters or at least their respective corners. Ref absolutely ruined that fight. Some might call it boring but it’s difficult to put combinations together if the ref is going to step between you every time you get in range. Professional job by Joshua against Parker who I thought was quite awkward and if he had a little more ambition might have been capable of an upset. Complete piss take of a fight that was. If Fury genuinely thinks he can get into a ring with AJ and come out with the win then he’s in for one hell of a shock, AJ will destroy him. The fight in the crowd looked better than the 2 jokers in the ring. it reminded me of a Laurel and Hardy film just two men one big one small running around a ring . How the Boxing authorities condone this is beyond me . I just cant take to Tyson and seeing his antics last night didn't help are people really saying he is mentally fit?? Usyk is a hell of a boxer like. And will expose bellew in my opinion. I can't stand bellew. My bluenose mates think it's to do with Everton but it's not. I just don't like him as a person or a fighter. If he fights and beats usyk then it will be his best and most credible win of his career. Those Haye fights were a joke. Fury fight was a bore fest again how he has a shot at the title I don't know. He's a pitter patter boxer with no power. 10 rounds of a bore fest. He simply bores his opponents into submission. I just don't rate him he has incredible reach and height that's about it. I’d say that fight was worth getting up at 4am for. Surprised Canelo got the win though, thought GGG gave him a pounding. I love boxing but it's so corrupt. GGG needed a KO from the start. Canelo boxed well and it was a very good fight but there's no way he won that. Started well and then GGG grew into it and dominated from then on. If there's a third fight then it can't be in Vegas. GGG won both fights and got robbed twice. It's a farce. Agree. The first fight was a clear as day robbery and I don’t see how Canello can have won that by two rounds and now GGG lost his unbeaten record and his titles. Surely there is a way to score boxing independently rather than relying on 3 nobodies to decide the outcome. Great fight. Canelo can't look himself in the mirror and call himself the real champ, he knows he lost. Its funny how people see things in different ways. I thought Canelo was in control for most the fight. I saw GGG on the backfoot from the start and he wasn't comfortable. After 9 rounds I had Canelo in front by 3, the last 3 I had GGG winning 2 of them and Canelo the last round so I thought the judges scorecards which have now been published were spot on and the right decision was made. There was no way I saw Canelo taking a pounding as was described above other than being dominated a few rounds where GGG was given them anyway. Canelo deserved his win 100%. Honestly thought the rematch was an even clearer win for GGG than the first one. I'd be swerving the third fight in Vegas if I were GGG, he'll never win on points there. And we complain about Refs boxing needs to sort out its officials it is ruining the great sport! I watched the Canelo 3G fight again. Already knowing the outcome I could see if the judges screwed up or got it right. Many said that Canelo took 1,2,6,8. 3G Took 3-5,7, 9-12. I think Canelo took 1-4. 3G didnt press at all. Canelo landed numerous power shots and was constantly attacking. G3 was working the jabs but every 3 jabs Canelo backed him up with solid body shots and strong punches to Gs head. G finally came back in 5 6. He started connecting his jabs with 3 punch combinations. 7 and 8 were draws, i thought. Both fighters were connecting with power punches and jabs. 9-11 were all 3G. He was still not initiating the tempo but clearly took the rds. He connected his jabs with body shots, worked the power shots and at one point rocked Canelo with a solid upper cut/cross. Which would of KO'd anyone except Canelo. I think 12 was Canelo. The first min. 3G was dictating. The last 2 min. Canelo slipped a lot of 3Gs combinations, landed more power shots and stalked 3G. I thought Canelo won. 3G clearly took the middle rds and actually got better late. But, even though he won those middle rds, he was still backing up the whole time and not throwing the power shots. I think he was much better the 1st fight. This fight he looked tired and not the same guy who fought a year ago. Canelo had 1 cut above his left eye. But 3Gs face was a mess. Which was evident from Canelos power shots. 3G was proficient with the jab, but he couldnt stop Canelo. It was close but I think Canelo having considerably more power shots and combinations, constantly setting the tempo and 3Gs face being battered is what gave Canelo the Win. I hope we see the 3rd fight. They are both warriors. Well done to Callum Smith completely demolished Groves. Superb win by Callum and that first shot that rocked Groves before the barrage in the corner was so destructive. Groves just couldn't recover after that initial shot. 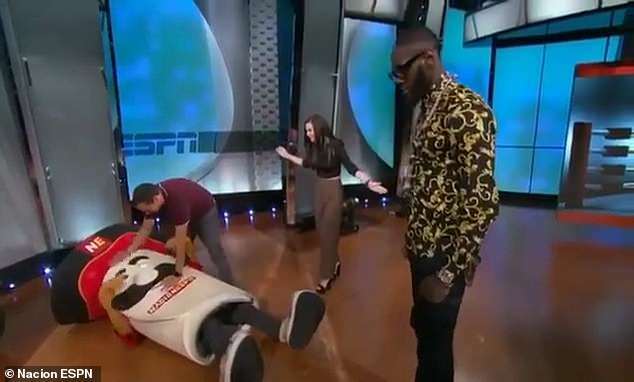 Deontay Wilder has apologised after reportedly breaking the jaw of a giant mascot on American TV. Appearing on Nacion ESPN, a Spanish-language show in the U.S., the Bronze Bomber was invited to land a jab on the mustachioed behemoth in what was supposed to be a light-hearted moment. 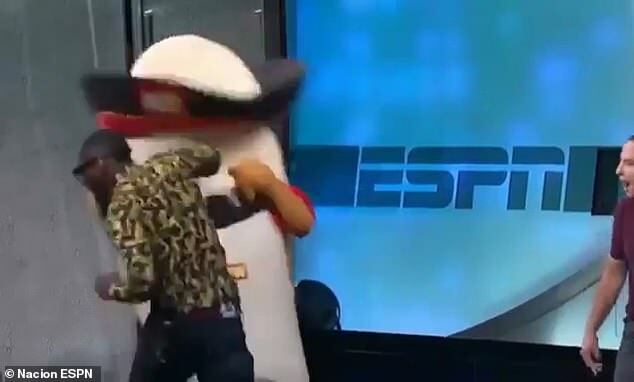 However, the 32-year-old shocked viewers by knocking the mascot to the floor with a powerful right hand. Media outlets claimed Wilder didn't realise there was a person inside the costume but he insists that wasn't the case. Speaking out on Instagram, the American said: ‘Yea, Anything headlining I didn’t know a “Human Being” was in there is just straight “Click Baiting”. ‘Like come on now, I guess the Mascot rolled out there. show so [sic] respect! I sincerely apologize to the brave man that was injured (if this is true). The American is set to face Tyson Fury on December 1 in Las Vegas and has been going face to face with his opponent in press conferences to promote the fight. Having hit the poor mascot, Wilder went on to berate his next victim. 'I'm gonna beat you, you little gypsy king. I'm a knock you out,' he said, addressing a rubber dummy. 'I said I was gonna knock you out. I've just got one question. When I knock your body on the canvas, which foot do you want me to step over you with? The right or the left? Fury is also in Los Angeles to promote the fight. He boasted on his Instagram story that he was winning the mental battles during the press conferences, of which the pair have now held three. 'I took Deontay Wilder to school today for the fourth time,' he told his followers. Fury took to Instagram on Saturday to share some videos of himself training and insisted he cannot wait for the showdown. Bellew outclassed by Usyk and caught by a right peach I wouldn’t be surprised he wakes up a red! Got given the knockout Haye said he’d be doing to him. Usyk really needs to set his sights elsewhere though before even contemplating the idea of taking on AJ. Going straight into heavyweight vs AJ and he’s in trouble, serious trouble. Bellew showing he's not ready for the top. As Ernie said, Usyk doesn't want a piece of AJ, that won't end well. AJ coming in for some stick from Lennox Lewis, saying he’s more bothered about the money than proving himself against top names like Wilder and to stop chasing easy pay days. Who has Wilder actually fought? Anyone of any note? In what will be his 41st fight, only now is he fighting someone you can deem a real contender, Fury. In them 41 fights he’d have fought 30, pretty much unknown Americans. Don’t get the rubbish talk about AJ and easy pays, just need to look at the list of names he’s faced compared to the list of names from the ones he’s apparently running from.